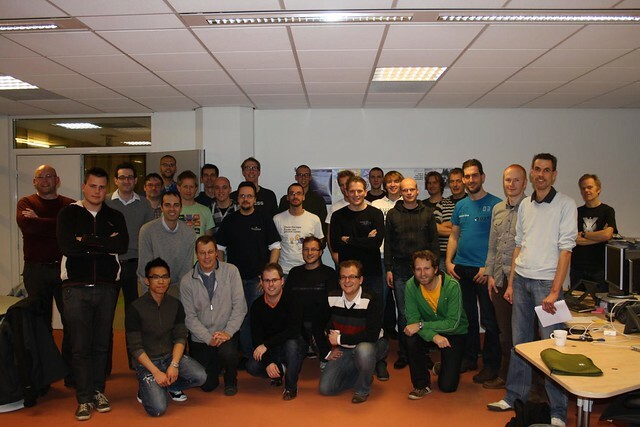 On Saturday the 3rd of December Devnology organised the Dutch participation for the Global Day Of Code Retreat. The event was hosted by Finalist and facilitated by Okke van 't Verlaat (@oftewel). The idea behind a code retreat is to create a place for passionate programmers to practice their skills away from the everyday pressure of delivering software. A place where experimentation and learning is the end goal. We had a crowd of 30 programmers getting up early to find their way to the Finalist offices in Rotterdam. Niek Schmoller (@nschmoller) made it all the way from Enschede, travelling some 200 kilometers to attend the event. For this we decided he deserved to win the license from sponsor JetBrains. Respect Niek! The format for this day was to code in pairs for 5 iterations, each of 45 minutes of coding, followed by a short 15 minutes evaluation. The assignment was to use the 45 minutes to create an implementation of Conway's Game of Life. Most people used the first two iterations to get a handle on the problem. In later iterations people got real creative and tried all different kind of approaches to the problem. Most people used the opportunity to pair with someone using a different language and/or environment then what they would normally use. We did not try some of the other constraints like Silent pairing, and I'm really keen to try these out at a future event. It was inspiring to be part of this global developer community of 2000+ developers all spending their weekend working on their skills in some 90 places in different timezones all over the world. Check out the Coderetreat Community Network for more reports of code retreats.